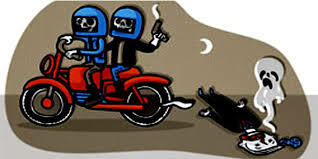 Police tags unidentified motorcycle riding-in-tandem in the Sunday evening shooting rampage, however, Placer Municipal Police Station is yet to establish the motive to the murder. Legazpi City, [08.27.18] – A village chief of Barangay Luna, Placer, Masbate and the head of Liga ng mga Barangay in the municipality of Placer, Masbate were killed in a shooting incident on Sunday. According to the police report, an initial police investigation conducted disclosed that while the victims were onboard on a motorcycle from the town proper of Placer going to the village of Daraga a motorcycle riding-in-tandem suspects shot the victims. The victims sustained multiple gunshot wounds in their bodies from an unknown caliber that caused their sudden deaths.